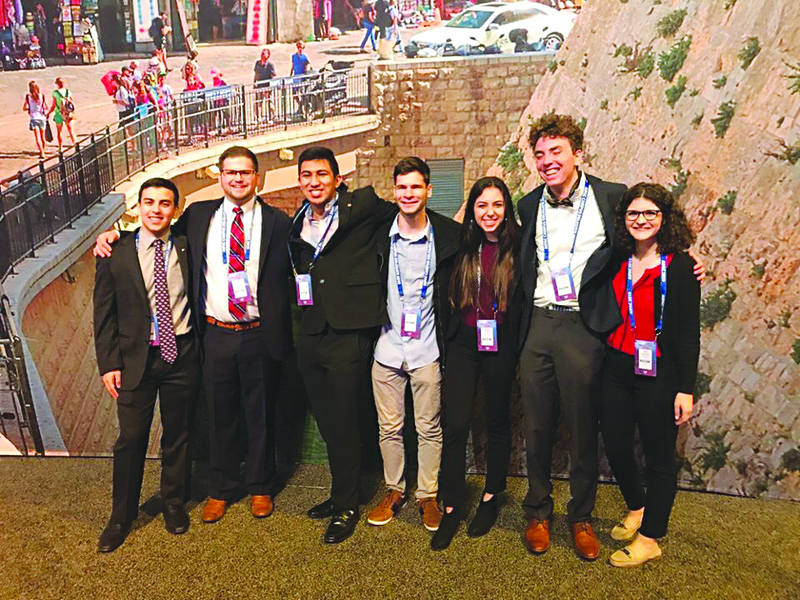 A delegation of UNT students attended AIPAC’s Policy Conference: Jordan Swidler, Aaron Platt, Chris Ynclan, Idan Pisek, Elena Okowita, Chase Clark, Jen Weintraub. I heard this word repeated time and time again at the 2019 AIPAC Policy Conference, which took place March 24-26 in Washington, D.C. But, with each repetition came a whole new wave of thrilling power. Each reference to this word by congressmen and congresswomen, senators, government figureheads and activists electrified the more than 18,000 AIPAC Policy Conference participants. It reminded us of the importance of fighting not only those who denounce Israel and her right to exist, but also of coming together as a nation in these politically divisive times. In a time of extreme political polarization and intense controversy, the theme of the policy conference, “Connected for Good,” held even more meaning than it might have at another time in our country’s history. As a college student just beginning my journey into defining and identifying my politics, my values, and my beliefs, the bipartisan theme resonated deeply with me. It reinforced in me that standing resolute in the ideals which shape my political identity is not something from which to hide, but rather, something to be celebrated. It proved that this mission, unity in support of Israel, which I hold so close to my heart, is a global one. It demonstrated the power of 18,000 people coming together to rally around a common cause. Most of all, it proved that, as a college student beginning this journey, I was not alone. More than 4,000 college students came together in D.C., comprising a significant portion of the AIPAC participants. Students of varying faiths, backgrounds, religions and political parties gathered from colleges and universities all across the nation. This delegation, recognized by several of the conference’s keynote speakers, represented the future of the American-Israeli relationship. The policy proved impactful not just for Jewish students, but for all who care about ensuring the continuity of the American-Israeli relationship. Addressing the interests of more than 18,000 people may seem a daunting task, but the conference was able to successfully tailor the sessions in meaningful and impactful ways. The audience, for example, in “Power Play: Women in Politics,” looked different than that of a typical session. The panel, which featured Democratic and Republican congresswomen and a neutral moderator, was filled with young women eager to dip their toes into the world of politics, ready to make an impact. Throughout the sessions and speakers, the theme of bipartisanship remained consistent. “When it seems like bipartisanship is in short supply, let it be clear that we stand in support of Israel’s right to defend herself,” said Senator Robert Menendez (D-N.J.) of the Senate Committee on Foreign Relations. I am a student who is constantly surrounded by a world of polarized media, fiery rhetoric, and drastically opposing political views from both sides, and entering into a political arena can feel slightly overwhelming. After attending AIPAC, however, I am no longer intimidated. I am ready. I am ready to do everything in my power to work with policy makers on both sides of the aisle to bridge the political divide. I am ready to advocate for strengthening and ensuring the existence of Israel, and the security of her statehood. I am ready to fight, and as the power of this AIPAC conference has shown, more than 4,000 college students are ready to fight along with me.